Several times a year I get a phone call or an email from a client that wants to lower the NH3 inventory below the federal 10,000lb threshold so they are no longer subject to the PSM/RMP rules. It’s a conversation I’ve had nearly a hundred times over my career, so I thought it would be worth writing down my thoughts on this subject for posterity. The factors break down into three categories: Logistical, Regulatory and Safety. Is it safe? A system operating below the level it was designed to operate is often called starved. Starved systems can be unsafe due to the increased rates of vapor propelled slugging and low vessel levels causing pumps to cavitate. This isn’t something you want to do without consulting a design engineer. Can I keep it at this level? If we dropped our system inventory to 9,900lbs., we are going to have to ensure it stays below the 10,000lb threshold or we can end up in a regulatory nightmare. Future charges (to replace losses) will require careful calculation to ensure that we stay on the right side of the threshold. This can be done through a good inventory management program, but it’s something you’re going to want to plan for. Regulatory: If we drop below the 10,000lb threshold, we can remove ourselves from the federal RMP & DHS registries, but we will still have to meet the OSHA and EPA General Duty requirements for our NH3 refrigeration system. When we discuss things like “recognized hazard” we are discussing the things that are outlined in appropriate RAGAGEP. What would be RAGAGEP for an NH3 refrigeration system below 10,000lbs? At a minimum, ALL the IIAR standards & bulletins as well as the IIAR ARM (Ammonia Refrigeration Management) program. What does that mean? The overall system safety management program will have to comply with the IIAR ARM program which is about 90% of the paperwork burden of a full PSM/RMP program. If you are looking at that list and thinking “There’s almost no benefit to dropping below the 10,000lbs mark from a regulatory standpoint” you aren’t wrong. There is ONE and it’s fairly minor: Generally speaking, your potential fines for violating OSHA’s or EPA’s General Duty clause are smaller than those for violating PSM/RMP. I say generally, because that’s not always the case. As an example, here’s a consent agreement for a $185,000 fine under the EPA’s General Duty clause. Let me summarize the regulatory situation of a General Duty NH3 refrigeration facility in a single sentence: A General Duty NH3 refrigeration system is going to have 95% of the regulatory burden of a PSM/RMP facility (and thus have to do the same things as a PSM/RMP facility would) but you won’t have the well-understood PSM/RMP structure to help manage that regulatory burden. Safety: In theory, any inventory reduction provides some small measure of reduced risk. In practical terms, though, there is usually very little effect. Often, due to the way our systems are designed (and the way the RMP scenarios are calculated) there is no change at all in the calculated area of effect of a release scenario*. Also, it’s important to keep in mind that very small amounts of NH3 can pose a danger to your personnel – it doesn’t matter that you’ve reduced your inventory from 11,000lbs to 9,900lbs when a release of 5lbs can pose mortal danger to a technician. In my experience though, the real danger of reducing your inventory below the threshold is that facilities that do so almost always give their General Duty compliance a lower priority than they gave to their PSM/RMP compliance. These facilities become less safe because they believe that they are less exposed to OSHA and the EPA. Conclusion: Yes, lowering your inventory can produce a slight increase in inherent safety and a lower regulatory exposure, but in practice, it usually does very little other than give the facility an excuse to de-prioritize safety and compliance. I work with many companies with National and International brands. Nearly ALL of these companies treat their General Duty facilities as if they have over the 10,000lb threshold, for the same reason: Brand protection – You never want to be in a position where you are making the argument that you didn’t provide the highest level of safety to your employees and your community because you didn’t have to by law! * No, Worst-Case and Alternate release scenarios are not required by General Duty plants, but I always calculate and map them so the facility understands the possible ramifications of a release on their community. 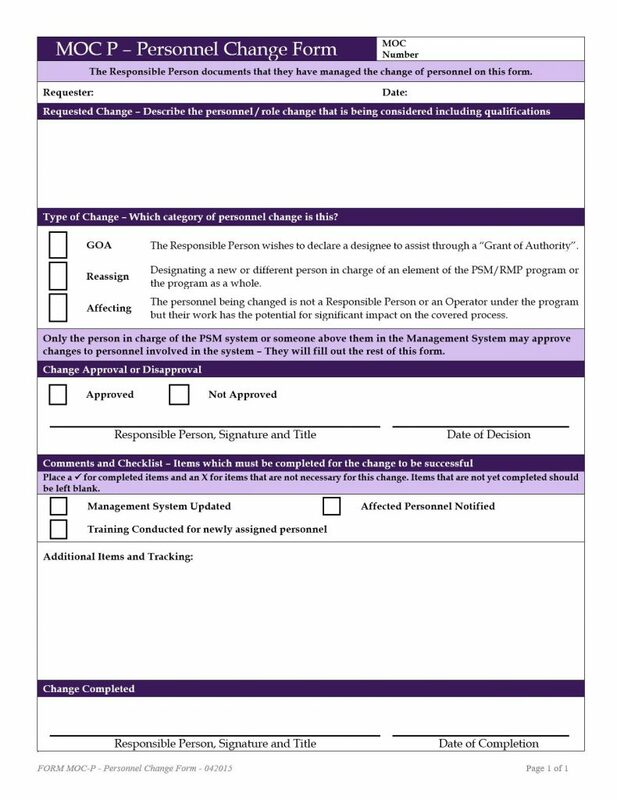 The Template What-If / Checklist worksheet used to guide PHA Studies has been modified. The Identification and Review of Past Incidents section has been renumbered with some new questions concerning the performance of the Incident Investigation element added before the example / industry What-If incident questions. We’ve added a new 57-question Revalidation Considerations Checklist to the current list of What-If questions. This new section is to be used as an additional check on PHA revalidations. These changes are available immediately to anyone using the Google Shared Drive. Note: These additions are partially based on an EPA-provided example of typical questions asked during a PHA revalidation. It has always been our practice to FULLY revalidate the PHA by reviewing all the previous answers; however, during a revalidation, this new section should help highlight areas of the existing PHA study that demand extra attention. In response to a recent LinkedIn forum post, here’s a short discussion on why MOC should be implemented for some personnel changes. The employer shall establish and implement written procedures to manage changes (except for “replacements in kind”) to process chemicals, technology, equipment, and procedures; and, changes to facilities that affect a covered process. Certainly, a change to certain personnel can be a change that affects a covered process and OSHA has cited this before when key players have changed such as the PSM coordinator, Maintenance Manager or Safety Director. To make life simpler, I use the “Management System” rule of thumb. 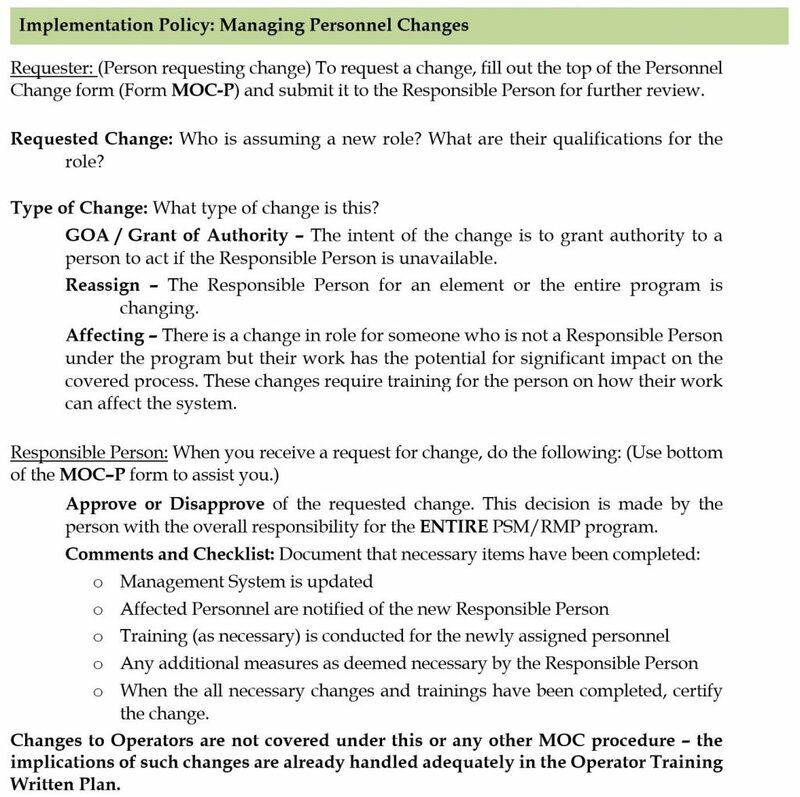 If the person is listed as a “Responsible Person” in the RMP Management System then they are covered in the MOC procedure. Here are my MOC/PSSR Written Plan (a.k.a. Guideline) section for MOC regarding personnel. Every program I’ve written and PSM class I’ve taught over the last five years uses some variation of this procedure/form. 1910.119(h)(1) Application. This paragraph applies to contractors performing maintenance or repair, turnaround, major renovation, or specialty work on or adjacent to a covered process. It does not apply to contractors providing incidental services which do not influence process safety, such as janitorial work, food and drink services, laundry, delivery or other supply services. This section covers which contractors are covered under the PSM/RMP rules. Since nearly all of these Contractor Qualification services cover all contractors, you are usually well covered here. 1910.119(h)(2)(i) The employer, when selecting a contractor, shall obtain and evaluate information regarding the contract employer’s safety performance and programs. Every Contractor Qualification service we’ve seen covers this area quite well – in fact, it’s the reason these services exist. 1910.119(h)(2)(ii) The employer shall inform contract employers of the known potential fire, explosion, or toxic release hazards related to the contractor’s work and the process. 1910.119(h)(2)(iii) The employer shall explain to contract employers the applicable provisions of the emergency action plan required by paragraph (n) of this section. Compliance Guidance: To assist in determining the applicable known potential fire, explosion or toxic release hazards that the host employer must inform the contract employers about, CSHOs should examine the host employer’s PHA. The PHA must identify the hazards of the process – 1910.119(e)(1) and (e)(3)(i). At a minimum, the hazards identified in the employer’s PHA which are applicable to the contractor’s work must be passed (“informed”) from the host employer to the contract employer – 1910.119(h)(2)(ii). In turn, the contract employer must then instruct its employees on the known potential fire, explosion or toxic release hazards of the process (1910.119(h)(3)(ii)), including, at a minimum, those hazards identified in the host employer’s PHA which are applicable to the contractor’s work. As you can see, this requires a deliberate and thoughtful analysis of the work the contractor will do and the hazards present by that work – and the area of the process they will be working on. A cookie-cutter Contractor Qualification service cannot provide this service so you need to make sure your program does. 1910.119(h)(2)(iv) The employer shall develop and implement safe work practices consistent with paragraph (f)(4) of this section, to control the entrance, presence and exit of contract employers and contract employees in covered process areas. Again, a Contractor Qualification service cannot provide this service – this is a facility level requirement that establishes and implements the procedures required under the Operating Procedures element. 1910.119(h)(2)(v) The employer shall periodically evaluate the performance of contract employers in fulfilling their obligations as specified in paragraph (h)(3) of this section. 1910.119(h)(2)(vi) The employer shall maintain a contract employee injury and illness log related to the contractor’s work in process areas. While a Contractor Qualification service can maintain some general information on the contractor in general such as injury rate and accident history, it will not know about the specific performance of a contractor at your facility – at least not as well as your own people will. 1910.119(h)(3)(i) The contract employer shall assure that each contract employee is trained in the work practices necessary to safely perform his/her job. 1910.119(h)(3)(ii) The contract employer shall assure that each contract employee is instructed in the known potential fire, explosion, or toxic release hazards related to his/her job and the process, and the applicable provisions of the emergency action plan. 1910.119(h)(3)(iii) The contract employer shall document that each contract employee has received and understood the training required by this paragraph. The contract employer shall prepare a record which contains the identity of the contract employee, the date of training, and the means used to verify that the employee understood the training. While a Contractor Qualification service can certainly request this documentation, what’s usually acceptable to the Contractor Qualification service is a generic “statement” on training, not the very specific training required based on the information provided under 1910.119(h)(2)(ii-iii). 1910.119(h)(3)(iv) The contract employer shall assure that each contract employee follows the safety rules of the facility including the safe work practices required by paragraph (f)(4) of this section. A Contractor Qualification service can certainly ask the contractor to provide a pledge that they will follow the safety rules / practices at the facility, but this can only really be proven through direct on-site examination of the contractor on a regular basis. 1910.119(h)(3)(v) The contract employer shall advise the employer of any unique hazards presented by the contract employer’s work, or of any hazards found by the contract employer’s work. A Contractor Qualification service will ask the contractor to provide this information, but very often the nature of the work (and the tools used to perform it) change during the project. Again, only direct on-site examination of the contractor on a regular basis can ensure that the contractor is compliant with this requirement. I hope this review has helped you understand how Contractor Qualification services can be useful to meet some PSM/RMP obligations, while showing you how they cannot replace your entire PSM/RMP Contractor element. The EPA has proposed to further delay the effective date to February 19, 2019. This action would allow the Agency time to consider petitions for reconsideration of this final rule and take further regulatory action, which could include proposing and finalizing a rule to revise the Risk Management Program amendments. This action would allow the Agency time to consider petitions for reconsideration of this final rule and take further regulatory action, which could include proposing and finalizing a rule to revise the Risk Management Program amendments. Comments. Written comments must be received by May 19, 2017. Public Hearing. The EPA will hold a public hearing on this proposed rule on April 19, 2017 in Washington, DC. ADDRESSES: Comments. Submit your comments, identified by Docket ID No. EPA-HQ-OEM-2015-0725, at http://www.regulations.gov. As always, I’ll keep you up to date on any changes to the PSM/RMP rules AND appropriate RAGAGEP. You may have recently heard a headline that OSHA is losing their right to cite you for something that happened more than six months ago. I’ve heard a disturbing amount of people tell me that this means that many PSM issues can be ignored, because – as long as they “get away” with it for six months – they are uncitable. From the vantage point of safety, this is absurd thinking. Taking such a risk, simply because you are unlikely to be caught, would be the equivalent of not wearing your seatbelt because you aren’t particularly likely to get in a car accident in any given drive. The difference is that when things go wrong in Process Safety, the results are usually far worse than the average car accident. Years ago, however, OSHA proposed and published a rule stating that “ongoing obligations” required some records to be kept longer – specifically injury and illness records. They stated, in part: “The OSH Act’s statute of limitations does not define OSHA violations, or address when violations occur, nor does the language…preclude continuing recordkeeping violations.” OSHA has actually issued several citations for items that were past the six month statute of limitations, in once case for an ongoing MOC violation that occurred over twelve years ago. OSHA lost several court cases with this “ongoing violation” issue. The House recently passed a CRA resolution to throw out this rule. Assuming the CRA continues, OSHA will not only continue to lose in court, but they will be barred from issuing a “substantially similar” rule in the future. This has led to a widespread belief that PSM violations that occurred over six months ago will no longer be citable. While that may be technically true, the reality is that they will still be citable as long as OSHA does the legwork to write the citations correctly. For my example, let me use one of the most common problems I see in Compliance Audits: A recommendation (from PHA or former Compliance Audit) from well over a year ago regarding the identification of surface corrosion on ammonia piping that recommends an increased frequency of inspections and/or remediation of the protective coating. If that recommendation was unaddressed, in the past OSHA would often cite the PHA or Compliance Audit element from which the recommendation came. Assuming that they are now limited to six months, and the recommendation is older than that, OSHA can NO LONGER cite you for that violation. Super. Congratulations… But, if OSHA could cite you for not following up on the recommendation, then it’s likely because the pipe is still showing signs of corrosion. That being the case, they CAN cite you for a 1910.119(j)(5) deficiency because the pipe IS rusted during the inspection. Put a simpler way – they can use the violation from the past to lead them to a violation occurring in-the-moment. Nearly ALL PSM citations can be rewritten to in-the-moment violations. Furthermore, although the old recommendation can’t be used for a citatable situation directly, it is PROOF POSITIVE that the employer was AWARE of the hazard. Worse yet, most EPA violations are only subject to the 28USC2462 five-year statute of limitations. It’s not like an OSHA CSHO or AD can’t pick up a phone and call the local EPA office. TLDR: The end result of OSHA losing their ability to cite for something in PSM that happened over six months ago: Nothing, really.